The standard nomenclature of the thing of the form that pulls the bucket forward and uses it is backhoe though the hydraulic excavator or the power shovel or the scraper or "Yunbo" is called as for the backhoe. It is a meaning of hoe that is pulled and used. "Yunbo" is originally a brand name of the backhoe of Mitsubishi Heavy Industries. The hydraulic excavator, the power shovel, the scraper, the backhoe, the drag shovel, "Yunbo", the reception desk shovel, the loading shovel, and the union name such as the oil pressure breakers seem to have been decided by corporation Japan Construction Equipment Manufacturers Association in the 1990's, "Hydraulic excavator". 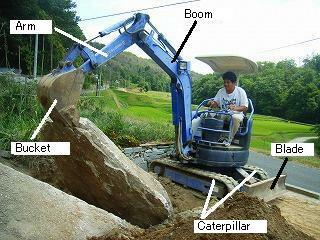 The driving lever of the backhoe is a lot, and is the one that where moves when which is operated is not understood easily first. However, it is possible to move it unconsciously like my hands and feet when becoming accustomed. I want to explain how to drive the backhoe this time. The part in which it works has divided into three parts greatly as man's arm as for the backhoe, and the name is called each bucket, the arm, and a boom from the working point. The bucket corresponds, and the arm corresponds by man's palm and the boom corresponds to the humerus in the forearm. Caterpillar (crawler) like the tank is used to move the entire backhoe. This Caterpillar has the one of iron it and the one made of rubber the surface. It is more general made of rubber because the wound places to asphalt when it moves on asphalt recently though the plastron is stronger. Moreover, there seem to be a lot of grading works and airframes and be a lot of one that the blade like a convenient bulldozer has adhered with stability in a small backhoe. The backhoe does all operation by the oil pressure. The rotation of the crawler is an oil pressure. Therefore, after the warm-up is done, and the temperature of the hydraulic fluid goes up, it operates it. Grease is injected into the part where the bucket, the arm, the boom, and the blade move in the warm-up. 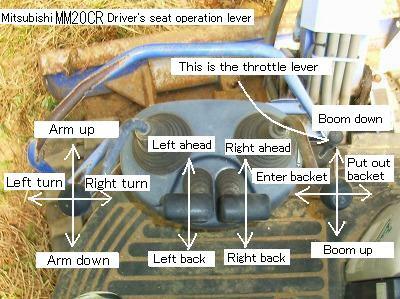 This photograph is Mitsubishi It is an operation lever of the driver's seat of MM20CR. It is like all looking like according to the model though the position might be a little different. There is a lever that moves to about two at the center in front of the driver's seat, and a right lever is a lever by which a right left lever moves a left caterpillar. The airframe is made to be advanced by this and it is made to retreat. When it knocks down only a left lever to previous, it rotates right, and the airframe rotates the airframe right fast at the same position when knocking it down at the same time behind a right lever. There is a thing that should be especially noted in the operation of this lever. Be for them will advance and the airframe to advance behind in view of those who drive when the lever is knocked down to previous when working at a certain position behind the blade because it can turn 360 times around the driver's seat in the upper half of the backhoe. Work in a small place and a high place is used to prevent such a misunderstanding, that is, it is sure to make the blade become ahead and want to work. The lever by which the right and left lever that is sideways moves the bucket, the arm, and the boom, and turns the upper part of the airframe. The following operation decided in JIS is generally done though there is the one with different the manner of operation according to the model, too. The boom can be knocked down, and it cause it by moving a right lever back and forth. The soil can be put in the bucket by moving a right lever to the left. The soil can be thrown away by moving this to the right. The upper part of the airframe can be rotated right and left by moving a left lever right and left. The arm can be moved up and down by moving a left lever back and forth. The land can be leveled while making them advance the backhoe because the blade like the bulldozer is attached to the backhoe, and retreat. Leveling the land of making them advance is very difficult though it understands when trying. It is a knack to level the land while making them retreat to finish. Moreover, it is possible to work with stability by lowering the braid (blade) when the position is fixed and it works. It is general that the switch pedal to move the arm right and left besides this and the switch pedal of the transport speed have adhered. There is no car inspection about the one classified into the small sized special vehicle by the backhoe. The light vehicle tax hangs if it owns and it registers to the municipality. It becomes a car of corresponding large-scale, specially or small and specially in the Road Traffic Law. It is large-scale, special or it is necessary to license small special if running in the public road. Then, the numberplate is also necessary. Registration to the municipality is needed. The compulsory automobile liability insurance is also necessary. The one like the driving license in the site of the backhoe is "Vehicle system construction machinery driving skill training end certificate. " in Occupational Health and Safety Law. To use it for a personal usage on my site, I do not think the qualification for the necessity to exist though it is said that do not drive if this is not. After the course is received, it is necessary to use it because there is not knowledge because it is a special machine and either it is dangerous when using it. It is necessary qualifications by all means if it undertakes a contract on business and for myself in the construction company. The vehicle system construction machinery driving skill training has two kinds of qualifications from 3 tons in the weight of the airframe to less than 3 tons (small size) in the weight of the airframe. I received a special education of the compact car both faction construction machinery driving skill in around 1996 because owned backhoes were less than three tons in the weight of the airframe. This course ended in a day. It was necessary to prove though there was no field test of having done the spot skill training in the shop etc. The review like the standard etc. of the small sized special vehicle was executed on July 1, 2004, and the item of total engine displacement 1500cc or less disappeared as follows.